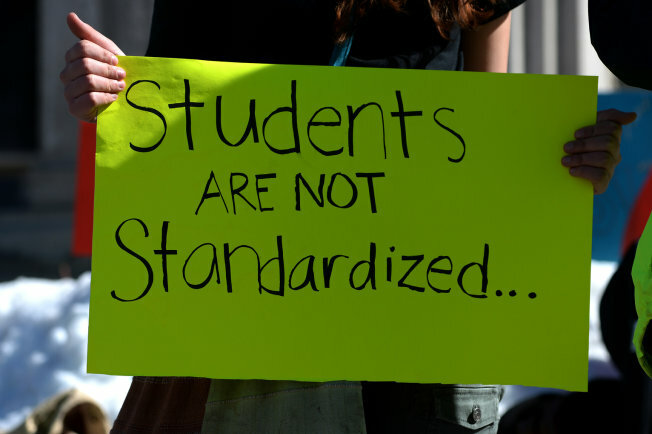 States, districts and schools sometimes claim they will lose federal Title I funds if parents, students or teachers boycott standardized tests required under No Child Left Behind (NCLB). However, in summer 2015 the U.S. Department of Education (DOE) acknowledged it has no plans to penalize districts or schools by withholding funds. That was DOE’s response after few districts in New York State reached NCLB’s 95% minimum participation requirement. While DOE said it could withhold funds if states do not do enough to persuade parents to participate, the chances of that happening are effectively zero. As far as we know, no school or district anywhere in the country has ever been penalized for failing to test enough of its students. Further, seven states (Utah, Wisconsin, Pennsylvania, Minnesota, Oregon, Washington and California) have laws allowing opt out, and none have been sanctioned. In fact, Oregon made it easier for students to opt out in 2015, but DOE has done nothing. Neither has any state taken steps to cut funds to schools. New York State had threatened to do so, but like the feds backed down. NCLB says that a school will fail to make “adequate yearly progress” (AYP) and then suffer sanctions if 95% of students do not take the test. However, this provision is now irrelevant. Third, in states without a waiver, every school must now have 100% of its students score “proficient.” As a result, almost all schools are “failing” and face possible sanctions. But if a school is already failing, there is no additional danger from a boycott. In addition, the 95% rule does not pertain to any tests other than NCLB’s reading and math exams. Tests used to judge teachers in other subjects as well as other state or district-mandated assessments are not covered by this requirement. There may be some risk for some schools due to the 95% rule. But for the great majority of schools, including Title I schools, the risk is minimal and should not be a reason to try to stop boycotts. The DOE has maintained that because Title I is a contract between federal and state governments, it can intervene, up to and including withholding funds or ending the contract, if states do not fully implement the agreement. In reality, even serious state failures, such as inadequate provisions for English language learners, have been negotiated and resolved. On occasion, DOE has withheld a portion of the limited money that goes directly to the states, but does not hold back funds that go to districts. Sanctions are a multi-step, multi-year process. Even if the DOE changes its mind, the Obama-Duncan administration is likely to be out of office before anything happens. In addition, Congress is moving to overhaul the law in 2015.Bills that already passed both houses of Congress contain provisions allowing parents to opt their children out. In sum: There is nothing to fear regarding loss of federal funds because of opting out. Advocates for testing reform should be sure to inform parents and teachers of this fact. These comments are generally applicable to all states. However, it is possible, for example, that your state is labeling more than 5% of schools as ‘priority’ (under waivers) or includes non-Title I schools under NLCB sanctions (for non-waiver states), though we do not know of such states. In addition, if your state or district has a high school graduation test or requires children to pass a test to be promoted to the next grade or get into a special school, your child likely will be at risk if you boycott. And your state may grade schools in ways that could be affected by boycotts (e.g., get a lower grade, which may or may not carry consequences). exempt from the sanctions under NCLB is at Sec. 1116(b)(2)(A)(ii). escalating sanctions are specified at Sec. 1116 for schools (b) and districts (c). ▪ States with waivers agreed they would intervene strongly in the lowest-scoring 5% of their schools (“priority” schools). (Another 10% are “focus” schools, but consequences are minimal.) States have identified their 5% schools. Schools that make sufficient test score gains will come off the list, while those that do not will remain on. States can choose to intervene in more schools, but to our knowledge have not. Over the next few years, states may replace exiting priority schools with new ones. If a state loses its waiver, NCLB requirements will again come into force – but almost all the schools will already have failed, making the 95% requirement irrelevant, as noted above. A brief US Ed. Dept. description of waivers is at http://www.ed.gov/sites/default/files/supporting-state-local-progress.pdf. For a print formatted copy of this fact sheet click here. No one seems to be talking about the unfortunate situation that we have young people doing everything required to earn a high school diploma but, ” if your state or district has a high school graduation test or requires children to pass a test to be promoted to the next grade or get into a special school, your child likely will be at risk if you boycott. And your state may grade schools in ways that could be affected by boycotts (e.g., get a lower grade, which may or may not carry consequences).” This is so wrong for so many reasons. Each parent needs to make a decision based on their student’s particular situation.